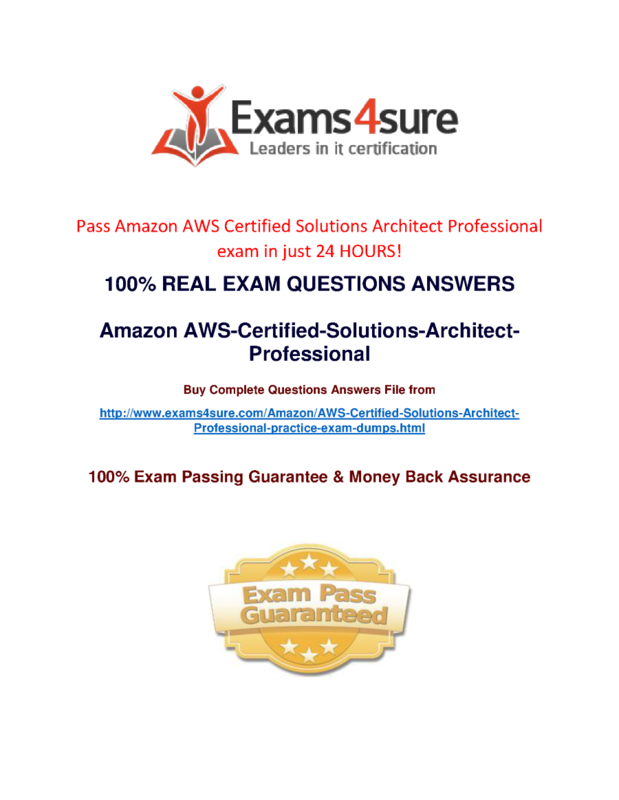 Sample Questions Question No : 1 You have an application running on an EC2 instance which will allow users to download files from a private S3 bucket using a pre-signed URL. Before generating the URL the application should verify the existence of the file in S3. How should the application use AWS credentials to access the S3 bucket securely A. Use the AWS account access keys the application retrieves the credentials from the source code of the application. B. Create an IAM role for EC2 that allows list access to objects In the S3 bucket launch the Instance with the role and retrieve the roles credentials from the EC2 instance metadata. C. Create an IAM user for the application with permissions that allow list access to the S3 bucket the application retrieves the 1AM user credentials from a temporary directory with permissions that allow read access only to the Application user. D. Create an IAM user for the application with permissions that allow list access to the S3 bucket launch the instance as the IAM user and retrieve the IAM users credentials from the EC2 instance user data. Answer: D Question No : 2 Your system recently experienced down time. During the troubleshooting process you found that a new administrator mistakenly terminated several production EC2 instances. Which of the following strategies will help prevent a similar situation in the future The administrator still must be able to: - launch start stop and terminate development resources - launch and start production instances. A. Leverage EC2 termination protection and multi-factor authentication which together require users to authenticate before terminating EC2 instances. B. Leverage resource based tagging along with an IAM user which can prevent specific users from terminating production EC2 resources. C. Create an IAM user which is not allowed to terminate instances by leveraging production EC2 termination protection.